Recession proofing your facility requires careful consideration of all time and safety issues pertinent to your process flow. With the correct material handling products, you can ensure that your production is being accomplished with maximum speed and efficiency and minimum risk of injury. Using the right also reduces the risk of penalties for non-compliance with safety regulations, and it can even possibly result in lowering general liability insurance rates. All material handling products are designed to either transport materials or store them safely and efficiently. Understanding the benefits of each product category makes procurement simple and cost effective. Easy Rack maintains a comprehensive inventory of material handling products to completely anticipate and meet the needs of industrial manufacturing and warehousing facilities. Easy Rack specialists will also help analyze your process flow if necessary to determine which products are the best fit for your particular facility. Pallet Jacks are material handling products that provide an economical way to move heavy pallet loads without the use of a fork truck. Many models found in our online inventory feature special ergonomic designs that allow operators to steer corners with minimal effort and to pull heavy loads with only 75 pounds of total force. Other models feature hydraulic systems that allow operators to lift up to 4,000 pounds without back or shoulder strain. Self dumping hoppers are large boxes with hinged bases that serve as waste disposal units. They can be picked up by fork trucks and emptied through a convenient self-dumping mechanism that closes once the waste is disposed of. Easy Rack carries a number of hoppers designed to carry everything from wood and broken down boxes to hazardous materials and liquid waste. Jib cranes and gantry cranes are material handling products that maximize mobility with a minimum of equipment and accessories. Gantry cranes feature pinned connections and do not require bolts or riveting for assembling. Not only can a worker disassemble these material handling products single handedly, the crane can also be carried with a two-strap harness that fits across the back. Jib cranes are material handling products that allow workers to work more quickly with less risk to personal safety. Jib cranes allow workers to lift materials from a cart to a workbench with no strain on the back. Both steel and aluminum models are available through Easy Rack. Lift master booms are material handling products that can add up to five feet in height to a fork truck. Easy Rack carries both telescoping and non-telescoping designs. Short booms specialize in moving equipment through tight spaces and aisles, while larger models can handle up to 4,000 pounds of weight. Hand trucks are some of the most versatile, cost effective, and efficient material handling products offered by Easy Rack. Specialized models exist for virtually every indoor and outdoor application. Each hand truck, regardless of design, is engineered to provide workers with the maximum amount of control for mobility regardless of weight loads. Most models are made from aluminum, although a fiber hand truck is also available for extra light loads and weight capacities. Choose from designs such as special four wheel models for outdoor terrain, dual handle model for added ergonomic comfort, dual directional for maneuvering between pallet racks and mezzanines, and “P”-handle hand trucks specifically manufactured for easily moving heavy and awkward sized loads. Work platforms are material handling products designed to provide a convenient method of safely and quickly transporting maintenance personnel where they are needed. They attach to fork trucks by means of fork pockets and chains. Units feature emergency stop button kits, web lanyards, and safety harnesses. Easy Rack shelving and storage solutions feature everything from pallet racks for general pallet storage to medium and heavy duty cantilever racks. Both lines of material handling products offer flexibility and multiple options for customization. High density storage, tool storage, and parts organization can be done with any number of bin storage cabinets and bar racks. These tools maximize your floor space and vertical cube and significantly reduce the necessity of having to move to larger facilities for an apparent lack of room. Fork extensions provide the extra support needed to lift long or large objects with a fork truck. Featuring welded steel construction with cast steel tips, steel retaining straps prevents fork extensions from sliding off forks during use. 06. 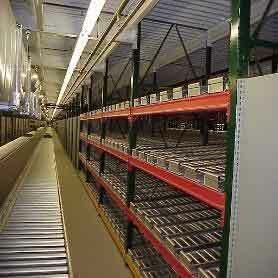 18 Gauge Steel 5 Shelf Closed Shelving Units. 08. 19,980 lb Capacity Tear Drop Pallet Rack Frames. Since purchasing your electric mini hoist last year, it has ..